Does Munawar Hasan know the implications of his views? Does Munawar Hasan know the implications of his views? Will this qataal be against Pakistani security forces, political and religious leadership, parties or the entire system? Is the state on the wrong side and Taliban on the right or vice versa? Does JI support al-Qaeda? It is ironical that he was the Ameer of JI and a successor of Maulana Maududi. Did Maududi write his famous book Aljehad Fil Islam on the strategy of qataal in a Muslim society? Munawar Hasan himself has never visited the battlefield himself or allowed his family members to go to the frontline. His assertion is likely to be misconstrued as an invitation/permission for violent reformation struggle. Munawar Hasan represents a narrative in Pakistan that has many buyers. This narrative looks at democracy and electoral system as a hurdle in change. He dreams of an Islamic revolution, favours use of force to coerce compliance to Shariah, doesn’t accept the state boundaries and believes in Ummah as a political concept, sympathises with militants and considers them Mujahideen, thinks suicide attacks and terrorism are planned and executed by local agencies or Raw, CIA, Blackwater and attributed to Muslims to malign Islam, opposes military operations against militants and urges talks with them and so on. He is not alone in these views. And there are many reasons — our dysfunctional system of justice and social services delivery system has disillusioned the masses. Private TV channels, intellectuals, religious class and state institutions have played their role to perpetuate and expand this disillusionment. Anti-democracy sentiments have spread especially in religious parties which have traditionally received negligible electoral success. The JUI F talks of democracy, for it has enjoyed sufficient electoral benefits. Earlier, Munawar Hasan had said that JI shared the same ideology with TTP and that the difference was in the tactics that JI employed. But how could JI, a political party that believes in democracy and constitutional rule within Pakistan, and al Qaeda and TTP, militant violent outfits that work for global khilafat, have same ideology. Munawar Hasan represents a narrative in Pakistan that has many buyers. This narrative looks at democracy and electoral system as a hurdle in change. He dreams of an Islamic revolution. There is no room for violent means in the JI strategy. Article 5 of the JI Constitution spells out that for the desired reform and revolution, the Jamaat shall use democratic and constitutional means, i.e., the use of advice and propagation of thought for reforming the mind and character, and preparing public opinion for accepting the desired changes and that this struggle for the realisation of its objectives shall be open and public, and not on the pattern of secret movements. JI has several advantages vis-à-vis its rivals — discipline, countrywide support, internal democracy and simplicity. Even though Sirajul Haq, Ameer JI, says ballot paper is the only source of power and reformation, JI is at a crossroads. It has to decide whether it prefers the successful peaceful democratic Turkish model or the failed reactionary/violent Algerian and Egyptian models. It has to decide whether it has to maintain status quo in its targets, ideology, structure and strategy. Or it has to become an ultra right militant group like al-Qaeda and TTP, or it reviews its plans and performances in the light of careful analyses of failure of Egypt’s Muslim Brotherhood and Turkey’s Justice and Development Party, to shape anew its political vision and mission and become a modern party. Jihad is not synonymous with terrorism but opinions differ on what constitutes true jihad. For example, al-Qaeda and TTP assert that they fight for Islam; what is jihad for them is terrorism for others. There is no concept of war without state permission. War has only to be declared and managed by the state and government. Similarly, administration of justice and execution of punishment is also the sole authority of the state. Women, sick people, children, animals, crops and non-combatants cannot be targeted. And desecration of bodies and targeting of religious places is not allowed. All big religious schools of thought agree over this. There is no exemption for anyone. Maulana Maududi never approved of jihad by private outfits. He had even outlawed jihad in Kashmir in 1948 for Pakistan had infiltrated private fighters there without any formal declaration of war. Had he been alive, he certainly would not have liked JI’s militant leanings. Covert war against state(s) having diplomatic relations with Pakistan? Ummah is a spiritual concept but it is unfeasible as a political ideology. Unity is witnessed in Hajj which is a religious gathering. However, when Muslims come together in UN, OPEC, OIC, ECO etc which are political or economic entities, each country tries to safeguard its own interests for the ruler of each is the guardian of his nation who is accountable to/for his subjects. And when religious sects/parties cannot tolerate their rivals in other sects and in political struggle/fields and don’t unite into one, how could they argue for global Muslim Ummah neglecting state boundaries. Muslims live in different countries and though they have sympathies with Muslims, every state pursues its own national interests first. Sirajul Haq as a political leader prefers his party interests. As KP Finance Minister, he is not ready to share KP benefits with other provinces. At individual level, a Muslim doesn’t let stranger “Muslim brothers” enter his house or let them construct house on his land. Can he travel to another country without a valid visa issued by the other state from the Muslim ummah? Where is ummah in this equation? Religious parties are confused over the genesis of terrorism. Terrorism can either be the work of foreigners/non Muslims or of extremists who are unhappy with the foreign policy. It cannot be two things at the same time. If it is the work of the former, there should be no reason to attribute the rise of terrorism to our alliance with the West and to suggest withdrawal from the coalition or talks with them as the prerequisite for peace in the region. And if it is committed by extremists, foreign agencies get automatically absolved of the blame. Even if, as they say, Pakistan’s alliance with the West is the only reason for terrorism in Pakistan, does this justify the violence perpetrated by the extremists? They are yet to openly declare the TTP’s strategy unjust and un-Islamic. The author is an academic and a freelance columnist. He blogs at tahirkatlang.wordpress.com and can be reached at tahir_katlang@yahoo.com. When MH says Jihad and Qital is needed to support democratic dispensation which alone doesn’t suffice to solve problems, does he know what could be the implications of his views? Will this Qital be against Pakistani security forces, political and religious leadership, parties or the entire system? Is the state on the wrong and Taliban on the right or vice versa? 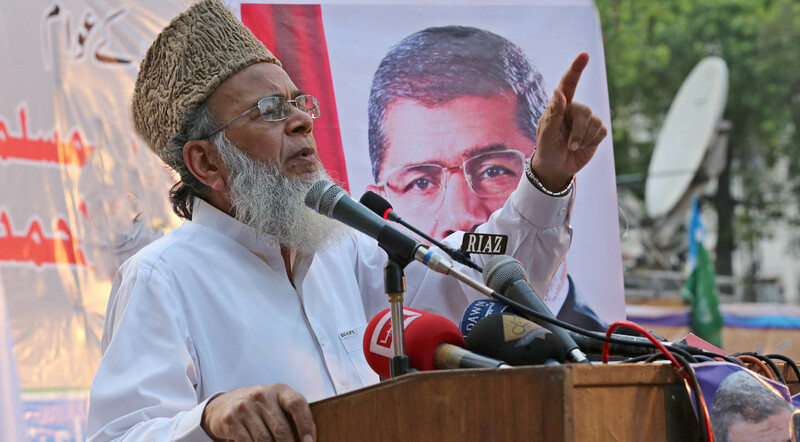 Does JI support Alqaeda? Is it legitimate to wage war against Pakistan and its citizens? The nation awaits clarification. It is ironical he was the Amir of JI and a successor of Maulana Madoodi who was famous for his constitutional mind. Did Maulana Maudoodi write his famous book Aljehad Fil Islam on the strategy of Qital in a Muslim society? And then MH has passed almost his entire life in the peaceful democratic political struggle. He doesn’t seem ever to have visited battlefield himself or allowed his family members to go to the frontline of Qital. Then why this assertion which could be misunderstood by Pakistani youth as an invitation/permission for violent reformation struggle. By persisting with intermittent statements that often trigger controversies, Munawar Hasan has shown that the leftwing activist in him who joined the National Students Federation – a student body with a communist ideology- and was elected its President in 1959 is very much still there. In NSF, he seems to have contracted an extreme hatred for the ‘US Imperialism’ that still overwhelmingly shapes his thoughts. Whosoever that fights or claims to fight with the US becomes his hero. An acute hatred of this kind often leads one to deviate from the path of justice and fair-play. Munawar Hasan represents a narrative in Pakistan that has, nevertheless, many buyers here. This narrative looks at democracy and electoral system as a hurdle in change’; dreams of an Islamic revolution; favours use of force to coerce compliance to Shariah; doesn’t accept the state boundaries and believes in Ummah as a political concept; sympathises with militants and considers them Mujahideen in Allah’s path; thinks suicide attacks and terrorism are planned and executed by local agencies or Raw, CIA, Blackwater and attributed to Muslims to malign Islam; opposes military operations against militants and urges talks with them and so on. He is not alone in these views. Many do so. Reasons thereof are many. Our dysfunctional system of justice and social services delivery system has disillusioned the masses. Private TV channels, intellectuals, religious class and state institutions played their role to perpetuate and expand this disillusionment. Anti-democracy sentiments have spread enormously especially in religious parties which have traditionally received negligible electoral success. JUI F talks of democracy for it has enjoyed sufficient benefits from its democratic manoeuvres so far. Earlier, Munawar Hasan had said that JI shared the same ideology with TTP and that the difference was in the tactics that JI employed. But how could JI, a political party that believes in democracy and constitutional rule within Pakistan, and Alqaeda and TTP, militant violent outfits that work for global khilafat, have same ideology, one fails to understand. There is no room for violent means in JI strategy. Article 5 of the JI Constitution spells out that for the desired reform and revolution, the Jamaat shall use democratic and constitutional means, i.e., the use of advice and propagation of thought for reforming the mind and character and preparing public opinion for accepting the desired changes and that this struggle for the realisation of its objectives shall be open and public, and not on the pattern of secret movements. JI has several advantages vis-à-vis its rivals like discipline, countrywide support, internal democracy and simplicity. Even though Sirajul Haq, Amir JI, says ballot paper is the only source of power and reformation, JI is at a crossroads. It has to decide whether it prefers the successful peaceful democratic Turkish model or the failed reactionary/violent Algerian and Egyptian models. It has to decide whether it has to maintain status quo in its targets, ideology, structure and strategy. Or it has to become an ultra right militant group like Alqaeda and TTP, or it reviews its plans and performances in the light of careful analysis of failure of Egypt’s Muslim brotherhood and turkey’s Justice and Development Party, to shape anew its political vision and mission and become a modern party. Religion doesn’t prescribe a particular political system but it gives broad principles that the government of the Muslims be formed and run through consultations, that it should be obeyed in all matters except vices, that disobedience to it is a sin and revolt against it is not allowed unless a kufre bawah (open heresy like denouncing Quran or prayer or Haj for example) is witnessed, that baaghi (mutineers) and fasadi (mischief-mongers) will be with dealt severely etc. Prophet Muhammad (PBUH) said: “If someone ever hears some disgusting things from his ruler, he should observe patience because if anyone went out even a hand sized distance from the obedience of his government and died thus, he died in a state of jahiliant (ignorance) [Bukhari 7053]. But if he is ordered to commit a sin, he will neither listen to him nor obey him [Muslim 4763]. Jihad is not synonymous with terrorism but opinions differ on what constitute true Jihad. For example, Alqaeda and TTP assert that they fight for Islam. What is Jihad for them is terrorism to others. There is no concept of war without state permission. War has only to be declared and managed by the state and government. Similarly administration of justice and execution of punishment is also the sole authority of the state. Women, the sick, the children, animals, crops and Non-combatants cannot be targeted which are. And desecration of bodies and targeting of religious places is not allowed. All big religious schools of thought agree over this. There is no exemption in this principle for anyone. When Allah didn’t even confer on His prophets the right to declare war without first gaining state/sovereign power, how can it be given to the Mujahideen of today? Maulana Maudoodi never approved of Jihad by private outfits. He had even outlawed Jihad in Kashmir in 1948 for Pakistan had infiltrated private fighters there without any formal declaration of war. Had he been alive, he certainly would not have liked JI militant leanings. It is incomprehensible that MH learnt from his 40plus years of association with Maulana Maudoodi and JI that a culture of Qital needs to be spread in Pakistan. It deserves a better future than being subjected to and degenerated to be like Afghanistan, Iraq, Syria, Labya by recourse to militancy? Suicide attacks are also wrong and illegitimate from Islamic perspective for in a suicide attack, the attacker kills himself first with his own hands which is prohibited in Islam. The situation is Pakistan is that to the extent of statute book, all laws (except the interest based bank transactions) are in consonance with traditional Islamic jurisprudence. If our system has failed to deliver it is because the laws are not being rightly followed, plaintiff and defendant lie in courts, witnesses either decline to give testimony or give wrong one, the police is corrupt, the lawyers use delaying tactics and the court officials seek bribes. There is room for improvement but the only way to remove the shortcomings and bring improvement in the government and individuals is the peaceful non-violent way comprising strategies of education, incitement, persuasion, encouragement, giving good tidings and informing/cautioning on vices. The violent strategy for that purpose leads only to disunity, injustices, anarchy and destruction. Democracy may have its shortcomings but its benefits outnumber its drawbacks. It provides opportunity for gradual improvement. When peaceful change is possible (MMA, PTI mandate) why resort to illegal violent means? Extremists advocate Jihad increases compliance with Islamic laws. But Muslims are not bound or entitled to force people or governments to come to the right path. Even the prophets of Allah were bound to preach and not to be dictators and force compliance. How could others be? Preaching should be done slowly, gradually, peacefully, affectionately and patiently. All the great Scholars of all Islam- Imam Abu Hanifa, Imam Malik, Imam Ahmad, Imam Shafi, Imam Bukhari etc never resorted to armed struggle against Muslim rulers who were more vicious and sinful than the rulers of today. Ummah is a spiritual concept but it is unfeasible as a political ideology. Unity is witnessed in Hajj which is a religious gathering. However when Muslims come together in UN, OPEC, OIC, ECO etc which are political or economic entities, each tries to safeguard its own interests for the ruler of each is the guardian of his nation who is accountable to/for his subjects. And when religious sects/parties cannot tolerate their rivals in other sects and in political struggle/fields and don’t unite into one, how could they argue for global Muslim ummah neglecting state boundaries. Muslims live in different countries and though they have sympathies with Muslims, every state pursues its own national interests first. Sirajul Haq as a political leader prefers his party interests and as KP finance minister is not ready to share KP benefits with other provinces. At individual level, a Muslim doesn’t let stranger “Muslim brothers” enter his house or let them construct house on his land. Can he travel to another country without a valid visa issued by the other state from the Muslim ummah? Where is ummah in this equation? Many Islamists who are eager and impatient to bring revolution are confusing two things: first, to desire and work for reformation; two, to be able to realise the dream. While Muslims are asked to work for bringing reformation, they are not bound to ensure it at any cost. They have to work for that and if they fail, they still will be rewarded for their sincere efforts. Forgetting this difference leads one to resort to hasty violent means for achieving objectives. A collective system and its continuous reformation is the prerequisite for a civilised life but there is disagreement over whether reformation of society should precede that of the political system or follow it. One viewpoint argues when society and its people are reformed, governmental system will improve. The other says a competent and honest government automatically entails a transformed and honest society. Religious parties are confused over genesis of terrorism. Terrorism can either be the work of foreigners/non Muslims or of extremists who are unhappy with the foreign policy. It cannot be two things at the same time. If it is the work of the former, there should be no reason to attribute rise of terrorism to our alliance with the west and to suggest withdrawal from the coalition or talks with them as the pre-requisite for peace in the region. And if it is committed by the extremists, foreign agencies get automatically absolved of the blame. Almost the entire commentaries on the possible peace talks with the proscribed Tehreek-e-Taliban Pakistan (TTP) are focused on what and why to talk but the most important part of how talks are to be conducted and implemented has not been concentrated upon. There is little disagreement, at least in political circles, on that talks should be held but the all important implementation stage of agreement, which was neglected in the past deals that led to their failure and restart of militancy in the country, should be focused more than anything else. Khalid Aziz, Ex-Chief Secretary Khyber-Pakhtunkhwa and a tribal affairs expert, opines the country’s political leadership is trying to build a national consensus on what to do but neglecting how it is to be done. “Talks will be held as had already been. Hopefully, peace agreements would be signed as earlier done in Waziristan, Bajaur and Swat etc. Focus, to my mind, should have been on the implementation stage of agreements. It should be from the reverse side. It’s at the implementation stage that the real problems lie. So that stage needs more attention,” says Aziz. The Zardari-led Pakistan People’s Party (PPP), the federal government and the Pakistan army have neither supported nor rejected the talks. Their official policy statement is also yet to come on the Tribal Jirga and the guarantors proposed by Taliban. With militants continuously attacking the military personnel and installations (they released another video of beheading of six Pakistani soldiers recently), the Army may be reluctant to accept talks for the fear that it may be construed as weakness on its part. Aziz urges the inclusion of Pakistan Army, the federal government, the KP government and all political and religious parties and other stakeholders in the process. Though Taliban have asked Nawaz Sharif, Maulana Fazlur Rahman and Syed Munawar Hasan to become guarantors for the government and army, it is still not clear whether they themselves would give authority to the Tribal Jirga or appoint their own men for talks? And whether they would be acceptable to the government and Army? Will the Tribal Jirga have the guts to give independent decision against the TTP if it genuinely considers it on the wrong or will it pursue a policy of appeasement vis-à-vis them? Afrasiab Khattak, the president of the KP ANP, sounds optimistic that the peace talks would succeed. “There is national consensus on three points: one, that terrorism and extremism is a problem that must be addressed quickly; two, that dialogue is the first priority and other options would follow later; three, that the problem would be tackled within the framework of law, constitution, security and sovereignty of the country,” he says. The Central vice-Amir of JUI, Maulana Gul Naseeb Khan, is also hopeful. “We have organised the APC that was attended by almost the entire political and religious leadership from the opposition and the ruling sides. The basic responsibility of the peace talks rests with Tribal Jirga. Maulana Fazlur Rahman and KP Governor Engineer Shaukatullah will serve as a bridge between the Jirga and the parties in the conflict.” Khan says the Jirga will be extended in future and all parties will be included and taken along if needed. “We have shown our mettle in the past. We had held successful dialogue with the militants during the MMA government. There was no operation, no terrorism when we were in power during 2002-2007,” Khan claims. Gul Naseeb Khan says waak or authority by both the contending sides is must for empowering the Jirga to decide on the problem. The Tribal Jirga formed by the JUI has members from all the tribal agencies. But as its members were nominated by the JUI chief and may be his party men, they may be biased towards a certain viewpoint. Unless the Jirga is expanded by including members from other parties (and this should be done quickly), it won’t get the respect and backing from the Pakistani society it needs. There is obviously a communication gap between the stakeholders. There is a need to hold a national conference of all stakeholders. The present policy of leaving things to ‘the other’ by both civilian and military institutions should be given up. The national leadership should take up the responsibility instead of being in the background. If Nawaz Sharif, Maulana Fazlur Rahman and Munawar Hasan and other politicians claim they are national leaders and if they think Fata is part of Pakistan and it needs to be brought under the state writ, then they should lead from the front. A combined delegation consisting of members of the PML-N, the JI, the JUI (F and S) and other political parties, and teachers from Deobandi Madaris, military and civil establishment, judiciary, journalists, civil society etc should be formed, empowered and facilitated to start the dialogue process. It should ask the parties in the conflict to stop attacks and halt operations. If any side ignores its request and continues with its intransigence, it should inform the nation and unite the entire nation against it. This joint Jirga should seek authority from both the sides. It will then listen to the demands and statements of both the sides separately. Everyone wants peace, but how? Almost the entire commentaries on the possible peace-talks with the proscribed Tehreek-e-Taliban Pakistan (TTP) are focused on what and why to talk but the most important part of how talks are to be conducted and implemented has not been concentrated upon as it deserved. Khalid Aziz, Ex Chief Secretary Khyber Pakhtunkhwa and a renowned tribal affairs expert, opines the country’s political leadership is trying to build a national consensus on what to do but neglecting on how it is to be done. “Talks will be held as had already been. Hopefully peace-agreements would be signed as earlier done in Waziristan, Bajaur and Swat etc. Focus, to my mind, should have been on the implementation stage of agreements. It should be from the reverse side. It’s at the implementation stage that the real problems lie. So that stage needs more attention and more work on. Accusations of violation of the pact by each side and differences would certainly come up. These have been responsible for failure of earlier militants-government pacts in the past. Answers to questions like who would be guarantors and responsible for implementation of the jirga decisions, who will monitor the daily/minute details of progress on execution of agreement, what powers will they have etc needs to be discussed at length and consensus be built over them by all stakeholders. I mean there should be an elaborate implementation plan and execution structure already in place before any pact is signed,” he says. “I think administrative support is more vital than political support for the Tribal Jirga holding talks and in implementation of its decisions,” he adds. The Zardari-led Pakistan peoples’ party (PPP), the federal government and the Pakistan army have neither supported nor rejected the talks (it was PPP Parliamentarian, declared an NGO by federal government lawyer in Lahore high court, that attended the All parties conferences held on the issue). Their official policy statement is also yet to come on the Tribal Jirga and the guarantors proposed by Taliban. With militants continuously attacking the military personal and installations (they released another video of beheading six Pakistani soldiers recently) the Army may be reluctant to accept talks for the fear that it may be construed weakness on its part. And will it give its authority to a Tribal Jirga, which may be apparently supportive or apprehensive of Taliban? Aziz urges the inclusion of Pakistan Army, the federal government, KP government and all political and religious parties and other stakeholders in the process. Though Taliban have asked Nawaz Sharif, Maulana Fazlur Rahman and Syed Munawar Hassan to become guarantors for the government and army, it is still not clear whether they themselves would give authority to the Tribal Jirga or appoint their own men for talks? And whether they would be acceptable to the government and Army? Aziz said Taliban should be talked to as to who would be their guarantors but, I think, they would try to solve the issue through tribal customs and prefer tribal guarantors. Afrasiab Khatak, the president of the KP ANP, sounds optimistic that the peace-talks would succeed. “There is national consensus on three points: one, that terrorism and extremism is a problem that must be addressed quickly; two, that dialogue is the first priority and other options would follow later; three, that the problem would be tackled within the framework of law, constitution, security and sovereignty of the country,” he says. The Central vice Amir of JUI Maulana Gul Naseeb Khan, is also hopeful. “We have organised APC that was attended by the almost the entire political and religious leadership from opposition and ruling sides. The basic responsibility of the peace talks rests with Tribal Jirga. Maulana Fazlur Rehman and KP Governor Engineer Shaukatullah will serve as a bridge between the Jirga and the parties in the conflict. Jirga is to be extended in future. All parties will be included and taken along if needed,” he adds. When asked whether the Tribal Jirga will be given authority by Taliban and whether the jirga will be in a position to take independent decisions, Khattak said we should not go into details at this point. “All problems will be solved as the process goes on. It is a continuous process. The Tribal Jirga is there. One of the major successes is that it will be expanded. An all encompassing jirga would hold talks with militants and the government. It already has started its activities and talked to the Governor whose office would be a coordination office,” he adds. Gul Naseeb Khan said waak or authority by both the contending sides is must for empowering the jirga to decide on the problem. Maulan Naseeb said all state institutions would back the process of dialogue which is the collective decision of all opposition and governing parties. The Tribal Jirga formed by the JUI has members from all the tribal agencies but as its members were nominated by the JUI chief and may be his party-men, they may be biased towards a certain viewpoint. Unless the Jirga is expanded by including members from other parties (and this should be done quickly), it won’t get the respect and backing from the Pakistani society it needs. There is obviously communication gap between the stakeholders. There is a need to hold a national conference of all stakeholders. The present policy of leaving things to ‘the other’ by both civilian and military institutions should be given up. The national leadership should take up the responsibility instead of being in the background. If Nawaz Sharif, Maualan Fazlur Rehman and Munawar Hasan and other politicians claim they are national leaders and if they think Fata is part of Pakistan and it needs to be brought under the state writ, then they should lead from the front. A combined delegation consisting of members of PML-N, JI, JUI (F and S) and other political parties, and teachers from Deobandi Madaris, military and civil establishment, judiciary, journalists, civil society etc should be formed, empowered and facilitated to start the dialogue process. It should ask the parties in the conflict to stop attacks and halt operations. If any side ignores its request and continues with its intransigence, it should inform the nation and unite the entire nation against it. This joint jirga should seek authority from both the sides. It will then listen to the demands and statements of both sides separately. Then it will consider them in its private and confidential sessions. It will try first to reconcile the two opposing thoughts and if that is not possible, then it will take unbiased, neutral and rightful decisions. This body or another implementation body made by it will be responsible for supervision of the implementation of any agreement. For this it will have far reaching powers including that of hearing the appeals and deciding on the accusations by the two sides as well as appointing, transferring, calling, arresting and jailing those responsible for violating the terms of the treaty. (Added. Not included in the text sent to TNS) Drone attacks will have to be stopped and cease fire too will be required. The government will have to make a policy statement on talks in the parliament. The role of federal govt is vital as the centre of insurgency Fata is under its administrative control. A national conference of all stakeholders must be arranged without any delay. With the federal and Khyber-Pakhtunkhwa governments as well as the Tehrik-e-Taliban Pakistan (TTP) having agreed for negotiations — albeit with some conditions — there cannot be a better time to discuss the pros and cons of this process. What, at all, are the chances of this dialogue? What are the respective demands/conditions of both sides? What are the obstacles and how could these conflicting differences be bridged in a way that is acceptable to both the parties? What are the minimum requirements that will have to be fulfilled and the confidence-building measures that need to be taken by both the government and the TTP to create a conducive atmosphere for dialogue? Who among the Taliban should the government talk to and who should comprise the official or intermediary peace-body for negotiations? Which are the other national, regional and global stakeholders that need to be taken on board during the process? What should be the agenda of talks? Who will be the guarantors of any accord that is reached? What, are the chances of its success in bringing about peace in the volatile region? And what should be the subsequent options if the talks fail for intransigence? Questions such as these and others need to be focussed on and discussed at length for working out a viable agenda and a conducive atmosphere for talks towards sustainable peace in the region. The ANP Chief, Asfandyar Wali Khan, and the KP government recently said they were sincere in holding talks with the militants and that negotiations would be held before elections. However, no dialogue process has begun as yet. One hopes the talks are held and are successful in bringing about the much needed peace in the region. That the provincial government has only two months left to start/complete the lengthy peace process and that the militants and the government have sharp differences of opinion has led some experts to be sceptical of the process. There are other factors that show dialogue is still possible, even if a bit later. The US is holding negotiations with the Afghan Taliban. The Pakistani military establishment has changed the focus of its security doctrine from external to internal threats. Pakistan has released, and is releasing, the Afghan Taliban prisoners. It is reluctant to launch a military operation in North Waziristan (NWA) despite demands from the US. The successors of Maulvi Nazir in NWA have vowed to continue the truce with the Pakistan Army while the TTP too has pledged to abide by it. The incumbent regime is almost at the end of its term and with general elections at hand, the militants may halt their attacks and prefer to adopt await-and-see policy till a new government is installed after elections. Mehmood Shah opines that as dialogue with terrorists is not acceptable to the world, “the government will certainly ask the militants to accept Pakistan’s constitution, shun militancy, lay down arms and stop interference in Afghanistan before coming to the negotiating table.” They, on the other hand, would urge the release of their mates, withdrawal of army from the tribal belt, enforcement of Shariah and end to alliance with the US, says Shah. Sherpao says though parties differ in their priorities, these can be bridged or else the differences be kept aside for the time being. “The Taliban would obviously demand the enforcement of Sharia, end of support to America, release of their prisoners, cessation of war policy in Pakistan, payment of compensation etc. They would also ask for guarantors to supervise the implementation of an accord. But these problems can be discussed and sorted out later.” The first question would be how to bring the contending parties to the negotiation table, says Sherpao. Some experts are of the view that Pakistani Taliban are an extension of the Afghan Taliban. So talks with the Pakistani Taliban cannot be held in isolation. The two and other regional and global elements must be taken on board. Afghanistan president Hamid Karzai and Pakistani and American establishments still suspect each other. Each of them has its own list of enemies and friends. The friend of one is often the enemy for the other. Bridging this conflict of interest is essential. Whether the US would discontinue its drone programme inside Pakistan is still uncertain. An attack could spoil the entire peace process in no time. All stakeholders — Pakistan, Iran, US, Afghan government and Taliban along with other groups there, TTP, political parties — of the conflict will have to be taken on board during the peace process. The next government in Pakistan will have to own the process that begins today. For this, a national consensus between the stakeholders — political/religious parties, the security establishment, civil society — about the enemy, the ailment and the solution is needed. “The government will have to form a peace council/ reconciliatory commission that should be acceptable to all stakeholders. This reconciliatory body would be given ‘Waak’ (authority of representing and deciding on behalf of a party in a conflict) by the sides. It will first conduct negotiations and then supervise the implementation of the agreed decisions,” says Sherpao. To bridge the huge gap between the opposing views of the Taliban and the government, a mediator would be required. But an arbiter usually starts work on mutual request or at least upon the consent of the parties involved in a dispute. Again, an arbiter should be a neutral person or a body of people respected by all the parties concerned. He must be given authority or ‘Waak’ in Pushto. Has any Waak been given to a third party or arbitrator? “The militants are practically divided into several groups that are separate and independent from the TTP. For example, Maulana Fazlullah-led Swat Taliban and Maulvi Faqir-led Bajaur factions are not under the operational control of TTP. Then there are sharp differences on dealing with al Qaeda, Tajik, Uzbek and other foreign militants,” states Shah. With the federal and Khyber Pakhtunkhwa governments as well as the Tehrik-e-Taliban PakistAAAan (TTP) having agreed for negotiations –albeit with some conditions-, there cannot be a better time to discuss the pros and cons of this process. What are, at all, the chances of a dialogue? What are the respective demands/conditions of both the sides? What are the obstacles? How could/should these conflicting differences be bridged in a way that is acceptable to both the parties? What are the minimum requirements that will have to be fulfilled and the confidence building measures that need to be taken by both the government and the TTP to create conducive atmosphere for the dialogue? Who should be talked to and how? Who should comprise the official or intermediary peace-body for negotiations? Which are the other national, regional and global stake-holders that need to be taken on board during the process? What should be the agenda of talks? Who will be the guarantors of any accord that is reached at? What, if held, are the chances of its success to bring about peace in the volatile region? And what should be the subsequent options to curb militancy if the talks fail for intransigence? Questions such as these and others need to be focussed and discussed at length for working out a viable agenda and a conducive atmosphere for talks towards a sustainable peace in the region. The ANP Chief Asfandyar Wali Khan and KP government recently said they were sincere in holding talks with the militants and that negotiations would be held before elections. However, no dialogue process has begun as yet. One sincerely hopes that the talks would be held and would be successful in bringing about the much needed peace in the country and region. That the provincial government has only two months left with it to start/complete the lengthy peace process and that militants and government have sharp differences of opinion on the way forward has led some experts to be sceptical of the process. But there are some factors that show dialogue is possible, even if a bit later. The US is holding negotiations with the Afghan Taliban. Pakistani military establishment has changed the focus of its security doctrine from external to internal threats. Pakistan has released and is releasing Afghan Taliban prisoners. It is reluctant to launch military operation in NWA despite demands from the US. The successors of Maulvi Nazir in NWA have vowed to continue the truce with the Pakistan Army while the TTP too had pledged to abide by it. The incumbent regime is almost at the end of its term and with general elections at hand, the militants may halt their attacks and prefer to adopt wait and see till a new government is installed after elections. Mehmood Shah opines that as dialogue with terrorists is not acceptable to the world, “the government will certainly ask the militants to accept Pakistan’s constitution, shun militancy, lay down arms and stop interference in Afghanistan before coming to the negotiating table. But they would urge release of their mates, withdrawal of army from the tribal belt, enforcement of Shariah and end to alliance with the US,” he adds. Aftab Sherpao says though parties differ on their priorities’ list, these can be bridged or else differences be kept aside for the time being. “The Taliban would obviously demand enforcement of Sharia, end to support to America, release of their prisoners, cessation of war policy in Pakistan, payment of compensation etc. They would also ask for guarantors to supervise the implementation of an accord. But these problems can be discussed and sorted out later. The first question is how to bring the contending parties to the negotiation table,” he said. Experts say Pakistani Taliban are an extension of Afghan Taliban. So talks with the Pakistani Taliban cannot be held in isolation. The two and other regional and global elements must be taken on board. Afghanistan president Hamid Karzai and Pakistani and American establishment still doubt suspect each other. Each of them has its own list of enemies and friends. The friend of one is often the enemy for the other. Bridging this conflict of interest is a must. If US would discontinue its drone programme inside Pakistan is still uncertain. An attack could spoil the entire peace process in no time. All stake-holders –Pakistan, Iran, US, Afghan government and Taliban along with other groups there, TTP, political parties – of the conflict will have to be taken on board during peace process. The next government in Pakistan will have to own the process tomorrow that begins today. For this national consensus between the stakeholders -political/religious parties, the security establishment, civil society – as to who is enemy, what is the ailment and what is the solution is needed which is far from there. Confusion on the friends and enemies will have to be removed. “The government will have to form a peace council/ reconciliatory commission that should be acceptable to the stake holders. This reconciliatory body would be given Wak (authority of representing and deciding on behalf of a party in a conflict) by the sides. It will first conduct negotiations and then supervise the implementation of the agreed decisions,” says Sherpao. To bridge the huge gap between the opposing views of Taliban and government, a mediator or arbiter between the two is needed. But an arbiter usually starts work on the mutual request or at least upon the consent of the parties involved in a dispute. Again, an arbiter should be a neutral person or body of people respected by all parties. He must be given authority or “Waak” in Pushto. Has any Waak been given to a third party or arbitrator? “The militants are practically divided into several groups that are separate and independent from the TTP. For example Maulana Fazlullah-led Swat Taliban and Maulvi Faqir-led Bajaur factions are not under the operational control of TTP. Then there are sharp differences on dealing with Alqaeda, Tajik, Uzbak and other foreign militants,” states Shah. With no office for TTP still allowed or established, how and where talks would be held. Militants will be extremely reluctant to stop cross-border attacks. As a result, “The fearful losses which the enemy had sustained had made an appreciable diminution, not of an army, but of a population. For days their bodies lay scattered about. In the standing crops, in the ruins of villages, and among the rocks, festering bodies lay in the blazing sun, filling the valley with a dreadful smell. To devour these, great numbers of vultures quickly assembled and disputed the abundant prey with the odious lizards. The appeal to arms has brought devastation to the region and the people yet again. Names of contenders have changed. But miscalculations on the part of the anti-state group and the results are so shockingly identical. In Swat at least history did repeat itself recently. Swat and other districts of the Malakand division have been centres of intermittent religious — often hard-line — movements. The question is, are the Swatis prone to militancy too often? Are they extremists by nature? Earlier, Sufi Mohammad was brought over to Swat by the chief minister to harm Jamaat-e-Islami. He and his men took out weapons, cut off Swat and other districts from the rest of the country for days shouting ‘Shariat ya Shahadat’. The Shariah Regulation 1994 and another amended regulation in 1998 were enforced in submission to his demands — after all, the Pakistani constitution has Islamic provisions and there is no need for the new or old regulations. It requires a two-third majority in the parliament to amend the law but the gun-wielding militants forced the government to comply. Wajid Ali Khan, provincial Minister for Environment, says the people in Swat and Malakand have never been pro-extremism though historically they are pro-religion. He recalls that the people of the region voted for liberal parties like ANP and PPP ever since the 1970s. It was only in 2002 that they supported the MMA for a number of other factors. “When the PATA regulation governing Malakand was declared null and void in 1994, a vacuum was created. The mullahs and, later, Taliban took advantage of the situation and created a crisis on the issue. The people didn’t support them. They just desired speedy and cheap justice. If they had love for them, why would they have gone out of the area when the army launched the operation? Their immediate departure nullifies the notion that the Swatis love Taliban,” he declares.